I Come in Peace | What Smells So Good? I’m finally getting around to actually looking through some of the books I got for Christmas. While I always start with good intentions, I’m distracted so easily that it’s a wonder that I’m still in school. Mind you, I’m writing this post in class, but I at least look like I’m doing something. I can’t help it – if I’m bored by something (hello, another Anatomy and Physiology course after two years of it in college?) the mind wanders away on it’s own and I don’t pay attention to anything. Ironically, this system (which is basically a variation of how I do my homework: TV on, even though I’m not technically watching it) works wonders for my retention capabilities. Not only do I accomplish a bunch of other tasks, but I remember the lecture too... go figure. But I was talking about books from Christmas (see? Distracted!). One of the cutest gifts I received had to be a mini-cookie kit, complete with a tiny recipe book and wee cookie cutter in the shape of a heart. I actually have several small cookie cutters, which I believe are actually designed for use on fondant and gum paste, so it was a nice addition to have. The recipe booklet was a real treasure too, in with more standard shortbread, macaroon and chocolate chip inclusions were a handful of international bakes. One I kept being drawn to was for Pax Romana Cookies, with a lemony-almond flavour and crisp texture. What reeled me in was that it had a “cut-out” capability so I got to play with the new gift in full! The dough only had almond and lemon extracts in it though, so to “jazz” up my version I added some ground almonds in place of some of the flour and moistened the dough a touch with almond milk. To keep in the theme of the miniature kit, I opted to use my arsenal and make teeny ones. I figured (and correct me if I’m wrong) that "Pax Romana" translated roughly into “Roman peace”, and when I realized I had a tiny dove cookie cutter in my stash it just seemed right to use it! 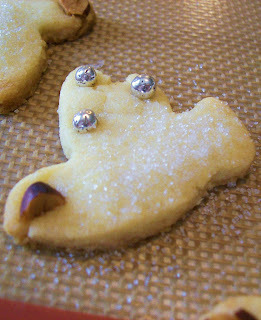 Not to mention bird cookies are pretty logical to decorate, especially when you have some gorgeous silver dragees and whole almonds hanging around! The wonderful woman who gave me the kit (I suppose she’s my step-aunt... is that even a term?) and the rest of the Italian side loved them when I brought the bag of these gems to her son’s hockey game. The slightly uneven texture was sandy without being dry or grainy thanks to the ground almonds, and the hint of lemon brightened them up and added a little flair. Since they used shortening instead of butter (I know... sacrilege) they kept their pretty cut-out shapes while baking and were nice and sturdy in transportation. I know butter is the baker’s... well, butter, but when it comes to the few times I make rolled sugar cookies I’m going to stick to the white stuff. Add almond milk, vanilla and extracts, beating until well blended. In another bowl, whisk tohether flour, ground almonds, baking powder and salt. Add to the creamed mixture and mix by hand until blended. Roll out onto a lightly floured surface about 1/8" thick. Cut dough into small cookies. Place 1" on ungreased cookie sheets. Decorate as desired. Bake 5 - 9 minutes or until edges begin to brown. Cool 2 minutes on baking sheet. Transfer cookies to cooling rack. Hey, if you can't name the bones in the human hand by feel (as my A&P instructor told us we'd need to do for our final), well ... you need more A&P, apparently.